Get FREE access to the bonus training video and 90-day action plan by entering your name and email address. Your privacy is important to us. We hate spam too! You'll get related updates and resources delivered to your inbox. As you face a changing job market, you may be struggling to adjust and survive. To survive, you need to embrace the online market and create multiple streams of income. One source of income is not enough anymore. In this comprehensive guide, I take you on a journey of my transition from the corporate world to the online business world and show how you can do the same. The book will help you assess your lifestyle and income needs, then map out a customized online income blueprint that addresses your current circumstances, personality type, skill sets and interests; something most training and business systems fail to take into consideration. You will learn about three online income models and four online business models that you can mix and match to fit your needs. All income and business models outlined in the book can be started and managed online by one person only and can easily be scaled to any business size you wish to operate. Insider secrets to surviving and thriving in the new online job market and internet business arena. Identify if you want an online job, a freelance contract online position or an online business and which one will allow you to maximize your strengths and achieve the lifestyle and income goals you want for yourself. Create a customized online income blueprint that addresses your current circumstances, personality type, skill sets and interests—something most training and business systems fail to take into consideration. Now that you know what you truly want and why you want it, its time to start implementing your plan and maximizing your results by tapping into services, products, affiliate marketing and/or licensing. In chapter one, you’ll learn about the changes in the job market and what that means to you. In chapter two, you’ll do a self-assessment and personality test to identify what income models you are more likely to succeed with. In chapter three, you’ll learn how to offer your services online and get employers or clients to pay for your time. Selling your services is an active form of income. So unless you are working, you won’t get paid. That is why in chapter four we dive into selling products online. You’ll learn what products are more likely to sell online and what products have higher profit margins. You’ll also learn about the pros and cons of making your own products, manufacturing, wholesale and drop shipping. In chapter five, you’ll learn about the easiest and most cost-effective way to add products to your income strategy. You don’t have to create any products, buy inventory or pay for storage. You don’t have to setup any merchant accounts, deal with shipping and handling, or returned items. Because you are going to learn about affiliate marketing done right. Chapter six takes you into the world of licensing. You’ll learn how you can dramatically increase your income by licensing your intellectual property to other businesses. You’ll also learn how you can purchase a license so you can operate as a franchise or sell other people’s products and services as if they were your own. In chapter seven, you’ll put all the pieces together. Using the information from the previous chapters, you’ll be able to customize your online income strategy and pick options you are most likely to succeed with. Chapter eight is all about leverage. You’ll learn how to take advantage of what you already have access to… and how to tap into existing solutions so you can get faster results. Because you have two options here… you can waste weeks, months or years trying to figure it out on your own and build everything from scratch, or you can use leverage to your advantage. In chapter nine, I take you behind the scenes and reveal some insider’s secrets about the most successful online business models. Chapter ten you start working on your personalized implementation strategy. By the time you have finished reading this book, you’ll know exactly how to make the Internet work for you, regardless of whether you want to be an employee, freelance contractor or business owner. You’ll know how to create an active income, passive income and residual income online. And how having a mix of services, products, affiliate marketing and licensing can allow you to have multiple streams of income. 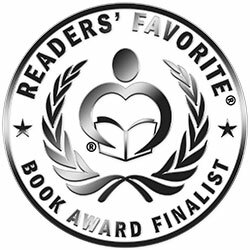 Pajama Paydays has been named the finalist in the Non-Fiction Business and Finance category for the 2018 Reader's Favorite Book Awards. In a changing job market, the book offers clarity, hope and guidance. If you plan to start an online business, this book should be where to start. If you don’t know what to do but want to consider options for passive income, then this book will be a wonderful guide for you. Hwayda covers many of the important topics and her engaging, instructive writing style makes this an interesting read. Whether you are an experienced professional or just starting out in your career, this book will definitely help before making the jump to working from home or online. 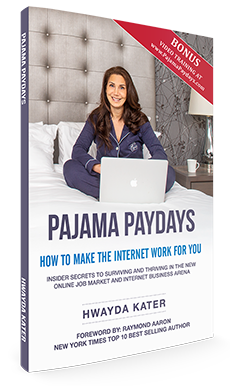 If you are just curious or you are seriously considering joining the online market, reading Pajama Paydays by Hwayda Kater will provide you with much needed insight. The book is written in a way that will prove informative to both the starter and anyone who is already established in this market. Her tone is one of encouraging hopefulness and honesty; she is direct and realistic. In sharing her own story of how she left the corporate world, and made the decision to work in her pajamas, Hwayda Kater becomes relatable to those who have had their struggles with today’s corporate climate. Hwayda has written an excellent book here on how to create an online business or migrate your current job/skills online. The book discusses physical products vs information products, the types of skills you should master to be successful, how to avoid scams, using leverage to your advantage … and so much more. I wish this book had been published when I got started online many years ago! I was quite pleased to find that Kater gave me new ideas for online businesses as well as some necessary guidance on how to get started. Her writing style is smooth and conversational, and I often felt as though Kater was personally instructing me on her subject.